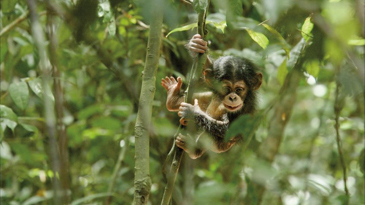 A still from the Disney film "Chimpanzee," featuring "Oskar" the chimp. Although portrayed as a continuous documentation, the principle scientific consultant on the film claims that five different apes were used to play the role of "Oskar." Have you seen the distressing article in the German Magazine Der Spiegel about the Disney film Chimpanzee: http://www.spiegel.de/international/zeitgeist/disney-chimp-film-a-splice-of-life-a-897140.html The article states that the producers (Alastair Fothergill and Mark Linfield) deliberately lied when they claimed that their film is a portrayal of real-life events. The story in the film is not true but made up. The film’s melodrama is a fairy tale and invented. To my mind, these are serious charges, but I’ve seen no follow up, no rebuttal from the producers or Disney, and little discussion about it in the press or blogosphere. What is your reading of the situation? And what is your reaction to the Spiegel revelations? This whole incident, if true, does sound like a bit of an echo of the “bad old days” at Disney True Life Adventures. But I suspect that this is not like the kind of blatant fiction Disney perpetrated in the “lemming mass suicide” sequence in White Wilderness. Even if they had “constructed” the plot of the film using a number of different individual animals from different locations, the plot itself had a certain “truthiness” (to use Stephen Colbert’s term) from a general audience’s point of view. And you yourself know that editing a number of animals together to depict the story of an individual character is no lapse of ethics -- provided the behaviors are all scientifically accurate. But when Mark Linfield has the hubris to say “If we had scripted it, no one would have believed us, "he is just asking to be “un-masked”. If the audience were to feel cheated and let down when the truth is revealed, would you still feel the same way? I hope I can explain. Using two or three different animals to construct a well edited sequence of a certain behavior is not un-ethical in and of itself. It is simply using the tools of our craft to tell stories that entertain and enlighten our audiences. Obviously, there’s a reason why our films are not exactly like being in the wild. Each of these examples are cinematic reconstructions of an experience of watching animals in the wild, but were probably filmed out of chronological sequence and then pieced together months later to give our audience a theatrical experience that might convey some understanding of what it’s like to be in the wild. All of this does not excuse the boastful, over reaching, and (possibly) deliberate un-truths in the Disney publicity materials. Theirs was an act of hubris, and one which audiences should find hard to forgive. But let’s not push this point to the extent that we have to condemn all the good, honest films that use standard montage techniques for the sake of some sort of ideological purity. I agree standard montage techniques, as described above, are acceptable. The reason those types of deceptions are acceptable is because audiences know enough about filmmaking that, if they were told exactly how those shots were made, they would feel OK about them and the trust they have in the wildlife filmmaker would not be diminished. But when deceptive filmmaking techniques are used in the field or editing room that would make audiences (were they to be told about them) feel betrayed, then we have gone over a line. This may not be an egregious ethical error, but surely the audience deception involved should not be encouraged. Isn’t it the beginning of a slippery slope? Remember, we’re talking about science-based wildlife documentaries. Audiences obviously approach narrative films with very different expectations. Using three different animals to construct one continuous behavior sequence of an anonymous, generalized animal in a wildlife documentary is acceptable (because the audience expects that). Using three or more different animals but explicitly telling the audience that it is all the same animal called “Rufus” may not be. The audience may identify with “Rufus” and feel real empathy towards this creature that they have come to know quite intimately. Were they to find out “Rufus” was an amalgam of several different animals, audiences might well begin to suspect that nothing the filmmaker says can really be trusted. Maintaining and strengthening the high trust between wildlife filmmakers and their audiences is key to the future of our industry. I accept your use of the word “simulacrum,” but the real test in all this is not what you and I think, but what audiences think. You can get a good sense of that from the Spiegel essay on Chimpanzee. If the Spiegel article is to be believed, then the producers of Chimpanzee brazenly lied in order to promote their careers and fatten their own wallets. You call it “hubris” and “deliberate untruths,” which is true. It is dishonorable and done on the assumption that the rest of us are credulous and gullible. That kind of behavior does the wildlife filmmaking industry irreparable damage. Perhaps the Spiegel essay got it wrong, in which case I retract what I’ve written here. As you know, I often like to start off a semester by confronting my students with this statement; “Everything you see on Television is a fabrication. Everything!” Usually the students disagree, saying that the “”news” or “documentaries” can’t be fabricated – they have to be true. “No,” I say, “Everything you see on Television is fabricated – every single second – even wildlife films!” Typically, a heated discussion ensues, where some students think that what I am saying about documentaries is nothing short of blasphemy. Eventually I point out that when I say something is fabricated, it has no bearing on whether it is true or false. It is often very easy to forget (especially watching a blue-chip natural history film) that a television program is a man-made object – something someone fabricated. The degree to which the images or words in the program relate to actual truths in the “real world” rests entirely with the intentions of the producer. Every viewer of a documentary must be willing to place their trust in the integrity of the producer. This does not mean that filmmaking is an act of deception, but rather, that the act of watching a documentary is, at its core, an act of faith. Place your trust with the right storyteller, and you are richly rewarded with a high-quality intellectual and artistic experience. Choose the wrong storyteller, and you may feel cheated, deceived, and betrayed. So, have Alastair and Mark been guilty of being “dishonorable” in their filmmaking? Perhaps. But, we should remember the many fine, upstanding films they have made in the past; Planet Earth, Blue Planet, etc – all of which, by the way, have artfully used the techniques of montage I seek to defend here. I rather suspect that they have been swept along by the inexorable force that is the Disney Hollywood Public Relations machine. While they may not be wholly innocent in this act of deception, we owe them a little bit of slack. After all, wasn’t it someone in Hollywood who taught us that “the lure of the dark side” is irresistibly strong? You describe watching a documentary as an “act of faith.” My contention is that increasing numbers of wildlife films are betraying that faith and traducing our audiences through audience deception, animal harassment, and misleading or absent conservation messages. I do agree that Alastair and Mark are hugely accomplished and thoroughly decent people who have done outstanding work. I would like to see them respond to the Spiegel article criticizing their film Chimpanzee, and would hope they can repudiate and rebut every charge. I think we agree that any filmmaker who is irresponsibly sensational, disregards common standards of good journalism, tells lies that audiences, or harasses innocent animals has crossed the line of ethical behavior -- no matter how profitable that kind of behavior might be. Truly egregious behaviors are easy to spot. The real ethical challenge comes at the fuzzy margins of ethical behavior, from filmmakers who think they know how to skirt the line while not crossing it. No doubt, the films you cited were made by people who profited from convincing themselves they were being “ethical enough” for television, and thought that they stayed on the right side of that fuzzy line. The financial rewards for “playing close to the edge” seem very tempting, and might tend to blur one’s view of which side of the line your film is on. NB. Read this statement from the Max Planck Institute for Evolutionary Anthropology, issued on the 30th April 2013: And the story is not made up – "Chimpanzee" is not a documentary film but still provides fascinating facts about our closest relatives. "Readers will be pleased to hear that the Der Speigel article was misleading and inaccurate in many places. As a result, Chris's and Tom's speculations are very unfair at best. Wildlife-Film.com have given us the opportunity to reply in the next edition and we will be doing so."